All water-soluble vitamins play a different kind of role in energy metabolism; they are required as functional parts of enzymes involved in energy release and storage. Vitamins and minerals that make up part of enzymes are referred to as coenzymes and cofactors, respectively. Coenzymes and cofactors are required by enzymes to catalyze a specific reaction. They assist in converting a substrate to an end-product. Coenzymes and cofactors are essential in catabolic pathways and play a role in many anabolic pathways too. In addition to being essential for metabolism, many vitamins and minerals are required for blood renewal and function. At insufficient levels in the diet these vitamins and minerals impair the health of blood and consequently the delivery of nutrients in and wastes out, amongst its many other functions. In this section we will focus on the vitamins that take part in metabolism and blood function and renewal. Coenzymes and cofactors are the particular vitamin or mineral required for enzymes to catalyze a specific reaction. Vitamin C levels in the body are affected by the amount in the diet, which influences how much is absorbed and how much the kidney allows to be excreted, such that the higher the intake, the more vitamin C is excreted. Vitamin C is not stored in any significant amount in the body, but once it has reduced a free radical, it is very effectively regenerated and therefore it can exist in the body as a functioning antioxidant for many weeks. Vitamin C’s ability to prevent disease has been debated for many years. 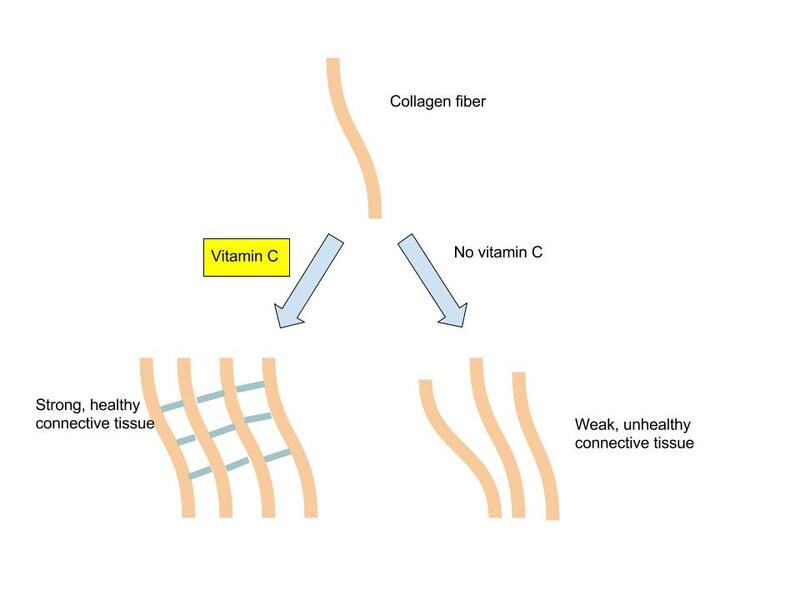 Overall, higher dietary intakes of vitamin C (via food intake, not supplements), are linked to decreased disease risk. A review of multiple studies published in the April 2009 issue of the Archives of Internal Medicine concludes there is moderate scientific evidence supporting the idea that higher dietary vitamin C intakes are correlated with reduced cardiovascular disease risk, but there is insufficient evidence to conclude that taking vitamin C supplements influences cardiovascular disease risk. Vitamin C levels in the body have been shown to correlate well with fruit and vegetable intake, and higher plasma vitamin C levels are linked to reduced risk of some chronic diseases. In a study involving over twenty thousand participants, people with the highest levels of circulating vitamin C had a 42 percent decreased risk for having a stroke. Vitamin C does have several roles in the immune system, and many people increase vitamin C intake either from diet or supplements when they have a cold. Many others take vitamin C supplements routinely to prevent colds. Contrary to this popular practice, however, there is no good evidence that vitamin C prevents a cold. A review of more than fifty years of studies published in 2004 in the Cochrane Database of Systematic Reviews concluded that taking vitamin C routinely does not prevent colds in most people, but it does slightly reduce cold severity and duration. Moreover, taking megadoses (up to 4 grams per day) at the onset of a cold provides no benefits. The RDAs and ULs for different age groups for vitamin C are listed in Table 9.11 “Dietary Reference Intakes for Vitamin C”. They are considered adequate to prevent scurvy. Vitamin C’s effectiveness as a free radical scavenger motivated the Institute of Medicine (IOM) to increase the RDA for smokers by 35 milligrams, as tobacco smoke is an environmental and behavioral contributor to free radicals in the body. Source: Dietary Supplement Fact Sheet: Vitamin C. National Institutes of Health, Office of Dietary Supplements. http://ods.od.nih.gov/factsheets/VitaminC-QuickFacts/. Updated June 24, 2011. Accessed October 5, 2017. Because vitamin C is water-soluble, it leaches away from foods considerably during cooking, freezing, thawing, and canning. Up to 50 percent of vitamin C can be boiled away. Therefore, to maximize vitamin C intake from foods, you should eat fruits and vegetables raw or lightly steamed. For the vitamin C content of various foods, see Table 9.12 “Vitamin C Content of Various Foods”. Thiamin is especially important in glucose metabolism. It acts as a cofactor for enzymes that break down glucose for energy production (Figure 9.7 “Enzyme Active Site for Cofactors” ). Thiamin plays a key role in nerve cells as the glucose that is catabolized by thiamin is needed for an energy source. Additionally, thiamin plays a role in the synthesis of neurotransmitters and is therefore required for RNA, DNA, and ATP synthesis. The brain and heart are most affected by a deficiency in thiamin. Thiamin deficiency, also known as beriberi, can cause symptoms of fatigue, confusion, movement impairment, pain in the lower extremities, swelling, and heart failure. It is prevalent in societies whose main dietary staple is white rice. During the processing of white rice, the bran is removed, along with what were called in the early nineteenth century, “accessory factors,” that are vital for metabolism. Dutch physician Dr. Christiaan Eijkman cured chickens of beriberi by feeding them unpolished rice bran in 1897. By 1912, Sir Frederick Gowland Hopkins determined from his experiments with animals that the “accessory factors,” eventually renamed vitamins, are needed in the diet to support growth, since animals fed a diet of pure carbohydrates, proteins, fats, and minerals failed to grow.Eijkman and Hopkins were awarded the Nobel Prize in Physiology (or Medicine) in 1929 for their discoveries in the emerging science of nutrition. Another common thiamin deficiency known as Wernicke- Korsakoff syndrome can cause similar symptoms as beriberi such as confusion, loss of coordination, vision changes, hallucinations, and may progress to coma and death. This condition is specific to alcoholics as diets high in alcohol can cause thiamin deficiency. Other individuals at risk include individuals who also consume diets typically low in micronutrients such as those with eating disorders, elderly, and individuals who have gone through gastric bypass surgery. The RDAs and ULs for different age groups for thiamin are listed in Table 9.13 “Dietary Reference Intakes for Thiamin”. There is no UL for thiamin because there has not been any reports on toxicity when excess amounts are consumed from food or supplements. Health Professional Fact Sheet: Thiamin. National Institutes of Health, Office of Dietary Supplements.https://ods.od.nih.gov/factsheets/Thiamin-HealthProfessional/ . Updated February 11, 2016 . Accessed October 5, 2017. Whole grains, meat and fish are great sources of thiamin. The United States as well as many other countries, fortify their refined breads and cereals. For the thiamin content of various foods, see Table 9.14 “Thiamin Content of Various Foods”. Riboflavin is an essential component of flavoproteins, which are coenzymes involved in many metabolic pathways of carbohydrate, lipid, and protein metabolism. Flavoproteins aid in the transfer of electrons in the electron transport chain. Furthermore, the functions of other B-vitamin coenzymes, such as vitamin B6 and folate, are dependent on the actions of flavoproteins. The “flavin” portion of riboflavin gives a bright yellow color to riboflavin, an attribute that helped lead to its discovery as a vitamin. When riboflavin is taken in excess amounts (supplement form) the excess will be excreted through your kidneys and show up in your urine. Although the color may alarm you, it is harmless. There are no adverse effects of high doses of riboflavin from foods or supplements that have been reported. Riboflavin deficiency, sometimes referred to as ariboflavinosis, is often accompanied by other dietary deficiencies (most notably protein) and can be common in people that suffer from alcoholism. This deficiency will usually also occur in conjunction with deficiencies of other B vitamins because the majority of B vitamins have similar food sources. Its signs and symptoms include dry, scaly skin, cracking of the lips and at the corners of the mouth, sore throat, itchy eyes, and light sensitivity. The RDAs for different age groups for riboflavin are listed in Table 9.15 “Dietary Reference Intakes for Riboflavin”. There is no UL for riboflavin because no toxicity has been reported when an excess amount has been consumed through foods or supplements. Fact Sheet for Health Professionals, Riboflavin. National Institute of Health, Office of Dietary Supplements. https://ods.od.nih.gov/factsheets/Riboflavin-HealthProfessional/. Updated February 11, 2016. Accessed October 22, 2017. Riboflavin can be found in a variety of different foods but it is important to remember that it can be destroyed by sunlight. Milk is one of the best sources of riboflavin in the diet and was once delivered and packaged in glass bottles. This packaging has changed to cloudy plastic containers or cardboard to help block the light from destroying the riboflavin in milk. For the riboflavin content of various foods, see Table 9.16 Riboflavin Content of Various Foods”. Niacin is a component of the coenzymes NADH and NADPH, which are involved in the catabolism and/or anabolism of carbohydrates, lipids, and proteins. NADH is the predominant electron carrier and transfers electrons to the electron-transport chain to make ATP. NADPH is also required for the anabolic pathways of fatty-acid and cholesterol synthesis. In contrast to other vitamins, niacin can be synthesized by humans from the amino acid tryptophan in an anabolic process requiring enzymes dependent on riboflavin, vitamin B6, and iron. Niacin is made from tryptophan only after tryptophan has met all of its other needs in the body. 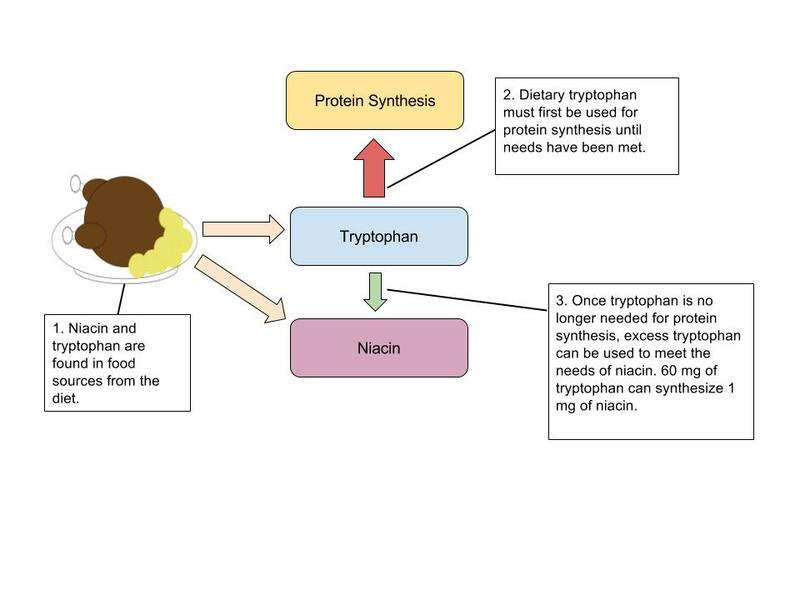 The contribution of tryptophan-derived niacin to niacin needs in the body varies widely and a few scientific studies have demonstrated that diets high in tryptophan have very little effect on niacin deficiency. Niacin deficiency is commonly known as pellagra and the symptoms include fatigue, decreased appetite, and indigestion. These symptoms are then commonly followed by the four D’s: diarrhea, dermatitis, dementia, and sometimes death. Micronutrient Information Center: Niacin. Oregon State University, Linus Pauling Institute. http://lpi.oregonstate.edu/mic/vitamins/niacin. Updated in July 2013. Accessed October 22, 2017. Niacin can be found in a variety of different foods such as yeast, meat, poultry, red fish, and cereal. In plants, especially mature grains, niacin can be bound to sugar molecules which can significantly decrease the niacin bioavailability. For the niacin content of various foods, see Table 9.18 “Niacin Content of Various Foods”. 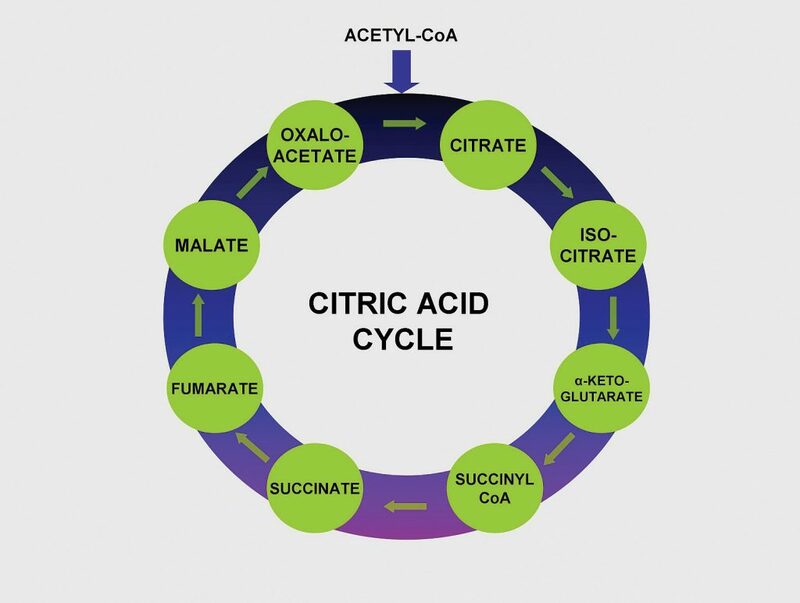 Pantothenic Acid (Vitamin B5) makes up coenzyme A, which carries the carbons of glucose, fatty acids, and amino acids into the citric acid cycle as Acetyl-CoA. Pantothenic acid forms coenzyme A, which is the main carrier of carbon molecules in a cell. Acetyl-CoA is the carbon carrier of glucose, fatty acids, and amino acids into the citric acid cycle (Figure 9.14 “Pantothenic Acid’s Role in the Citric Acid Cycle”). 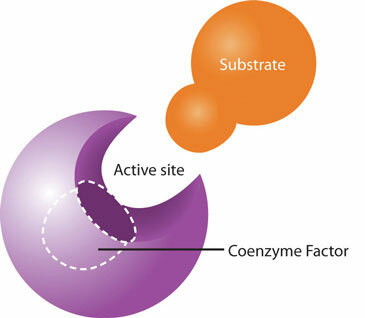 Coenzyme A is also involved in the synthesis of lipids, cholesterol, and acetylcholine (a neurotransmitter). A Pantothenic Acid deficiency is exceptionally rare. Signs and symptoms include fatigue, irritability, numbness, muscle pain, and cramps. You may have seen pantothenic acid on many ingredients lists for skin and hair care products; however there is no good scientific evidence that pantothenic acid improves human skin or hair. Because there is little information on the requirements for pantothenic acids, the Food and Nutrition Board (FNB) has developed Adequate Intakes (AI) based on the observed dietary intakes in healthy population groups. The AI for different age groups for pantothenic acid are listed in Table 9.19 “Dietary Reference Intakes for Pantothenic Acid “. Micronutrient Information Center: Pantothenic Acid. Oregon State University, Linus Pauling Institute. http://lpi.oregonstate.edu/mic/vitamins/patothenic-acid . Updated in July 2013. Accessed October 22, 2017. Pantothenic Acid is widely distributed in all types of food, which is why a deficiency in this nutrient is rare. Pantothenic Acid gets its name from the greek word “pantothen” which means “from everywhere”. For the pantothenic acid content of various foods, see Table 9.20 Pantothenic Acid Content of Various Foods”. Biotin is required as a coenzyme in the citric acid cycle and in lipid metabolism. It is also required as an enzyme in the synthesis of glucose and some nonessential amino acids. A specific enzyme, biotinidase, is required to release biotin from protein so that it can be absorbed in the gut. There is some bacterial synthesis of biotin that occurs in the colon; however this is not a significant source of biotin. Biotin deficiency is rare, but can be caused by eating large amounts of egg whites over an extended period of time. This is because a protein in egg whites tightly binds to biotin making it unavailable for absorption. A rare genetic disease-causing malfunction of the biotinidase enzyme also results in biotin deficiency. Symptoms of biotin deficiency are similar to those of other B vitamins, but may also include hair loss when severe. Because there is little information on the requirements for biotin, the FNB has developed Adequate Intakes (AI) based on the observed dietary intakes in healthy population groups. The AI for different age groups for biotin are listed in Table 9.21 “Dietary Reference Intakes for Biotin”. Fact Sheet for Health Professionals: Biotin. National Institute of Health, Office of Dietary Supplements. https://ods.od.nih.gov/factsheets/Biotin-HealthProfessional/. Updated October 3, 2017. Accessed November 10, 2017. Biotin can be found in foods such as eggs, fish, meat, seeds, nuts and certain vegetables. For the pantothenic acid content of various foods, see Table 9.22 Biotin Content of Various Foods”. Vitamin B6 is the coenzyme involved in a wide variety of functions in the body. 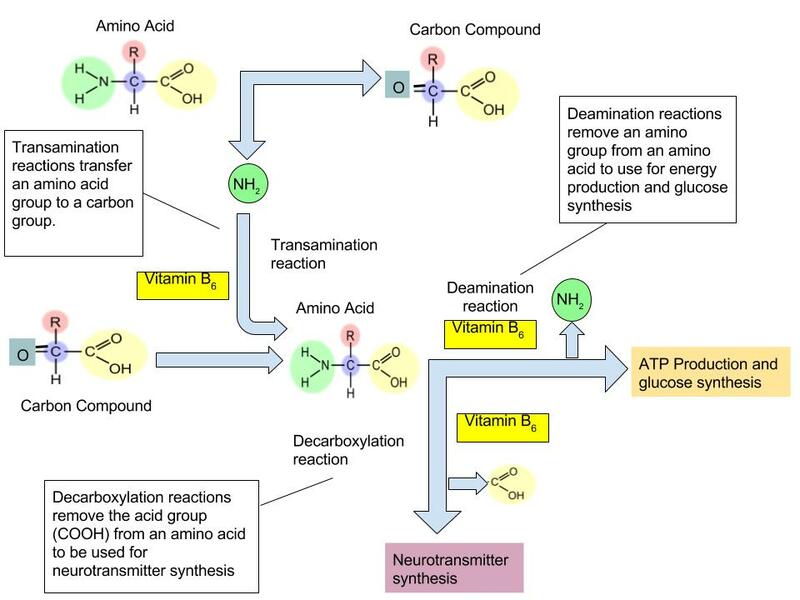 One major function is the nitrogen transfer between amino acids which plays a role in amino-acid synthesis and catabolism. 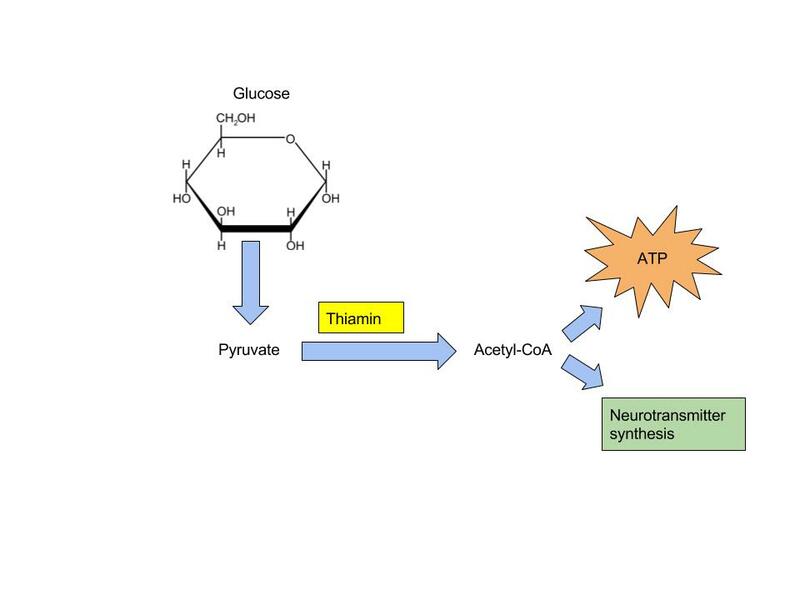 Also, it functions to release glucose from glycogen in the catabolic pathway of glycogenolysis and is required by enzymes for the synthesis of multiple neurotransmitters and hemoglobin (Figure 9.15 “The Function of Vitamin B6 in Amino Acid Metabolism”). Vitamin B6 is also a required coenzyme for the synthesis of hemoglobin. A deficiency in vitamin B6 can cause anemia, but it is of a different type than that caused by insufficient folate, cobalamin, or iron; although the symptoms are similar. The size of red blood cells is normal or somewhat smaller but the hemoglobin content is lower. This means each red blood cell has less capacity for carrying oxygen, resulting in muscle weakness, fatigue, and shortness of breath. Other deficiency symptoms of vitamin B6 can cause dermatitis, mouth sores, and confusion. The vitamin B6 coenzyme is needed for a number of different reactions that are essential for amino acid synthesis, catabolism for energy, and the synthesis of glucose and neurotransmitters. 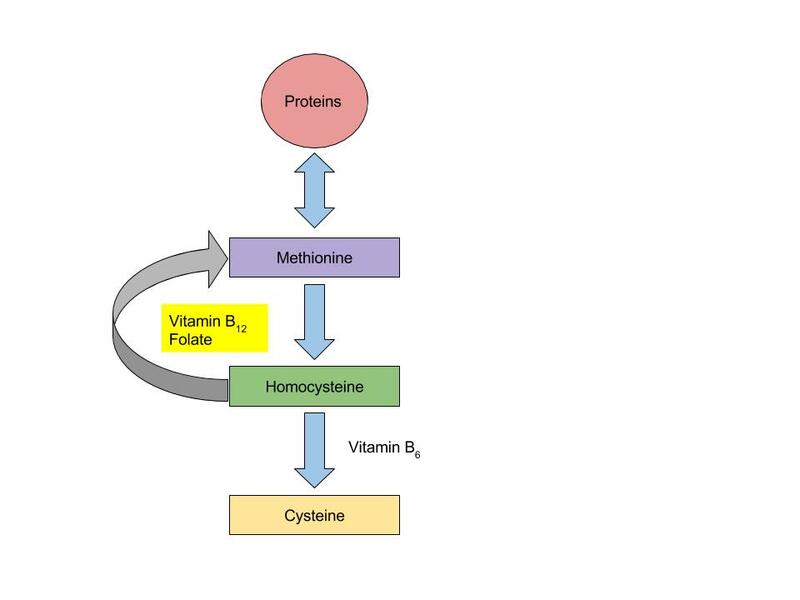 Vitamin B6 coenzyme is essential for the conversion of amino acid methionine into cysteine. 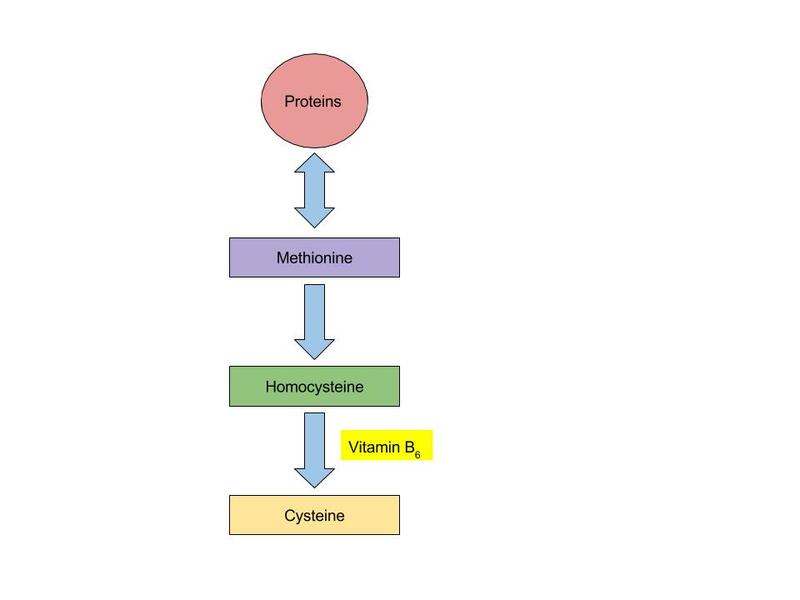 With low levels of Vitamin B6, homocysteine will build up in the blood. High levels of homocysteine increases the risk for heart disease. Currently, there are no adverse effects that have been associated with a high dietary intake of vitamin B6, but large supplemental doses can cause severe nerve impairment. To prevent this from occurring, the UL for adults is set at 100 mg/day. The RDAs and ULs for different age groups for vitamin B6 are listed in Table 9.23 “Dietary Reference Intakes for Vitamin B6“. Dietary Supplement Fact Sheet: Vitamin B6. National Institute of Health, Office of Dietary Supplements. https://ods.od.nih.gov/factsheets/VitaminB6-HealthProfessional/. Updates February 11, 2016. Accessed October 22, 2017. Vitamin B6 can be found in a variety of foods. The richest sources include fish, beef liver and other organ meats, potatoes, and other starchy vegetables and fruits. For the Vitamin B6 content of various foods, see Table 9.24 Vitamin B6 Content of Various Foods”. Folate is especially essential for the growth and specialization of cells of the central nervous system. Children whose mothers were folate-deficient during pregnancy have a higher risk of neural-tube birth defects. Folate deficiency is causally linked to the development of spina bifida, a neural-tube defect that occurs when the spine does not completely enclose the spinal cord. Spina bifida can lead to many physical and mental disabilities (Figure 9.18 “Spina Bifida in Infants” ). Observational studies show that the prevalence of neural-tube defects was decreased after the fortification of enriched cereal grain products with folate in 1996 in the United States (and 1998 in Canada) compared to before grain products were fortified with folate. Additionally, results of clinical trials have demonstrated that neural-tube defects are significantly decreased in the offspring of mothers who began taking folate supplements one month prior to becoming pregnant and throughout the pregnancy. In response to the scientific evidence, the Food and Nutrition Board of the Institute of Medicine (IOM) raised the RDA for folate to 600 micrograms per day for pregnant women. Some were concerned that higher folate intakes may cause colon cancer, however scientific studies refute this hypothesis. Spina bifida is a neural-tube defect that can have severe health consequences. The RDAs and ULs for different age groups for folate are listed in Table 9.25 “Dietary Reference Intakes for Folate “. Folate is a compound that is found naturally in foods. Folic acid however is the chemical structure form that is used in dietary supplements as well as enriched foods such as grains. The FNB has developed dietary folate equivalents (DFE) to reflect the fact that folic acid is more bioavailable and easily absorbed than folate found in food. The conversions for the different forms are listed below. Dietary Supplement Fact Sheet: Folate. National Institute of Health, Office of Dietary Supplements. https://ods.od.nih.gov/factsheets/Folate-HealthProfessional/. Updated April 20, 2016. Accessed October 22, 2017. Folate is found naturally in a wide variety of food especially in dark leafy vegetables, fruits, and animal products. The U.S. Food and Drug Administration (FDA) began requiring manufacturers to fortify enriched breads, cereals, flours, and cornmeal to increase the consumption of folate in the American diet. For the folate content of various foods, see Table 9.26 “Folate Content of Various Foods”. Vitamin B12 contains cobalt, making it the only vitamin that contains a metal ion. Vitamin B12 is an essential part of coenzymes. It is necessary for fat and protein catabolism, for folate coenzyme function, and for hemoglobin synthesis. An enzyme requiring vitamin B12 is needed by a folate-dependent enzyme to synthesize DNA. Thus, a deficiency in vitamin B12 has similar consequences to health as folate deficiency. In children and adults vitamin B12 deficiency causes macrocytic anemia, and in babies born to cobalamin-deficient mothers there is an increased risk for neural-tube defects. In order for the human body to absorb vitamin B12, the stomach, pancreas, and small intestine must be functioning properly. Cells in the stomach secrete a protein called intrinsic factor that is necessary for vitamin B12 absorption, which occurs in the small intestine. Impairment of secretion of this protein either caused by an autoimmune disease or by chronic inflammation of the stomach (such as that occurring in some people with H.pylori infection), can lead to the disease pernicious anemia, a type of macrocytic anemia. Vitamin B12 malabsorption is most common in the elderly, who may have impaired functioning of digestive organs, a normal consequence of aging. 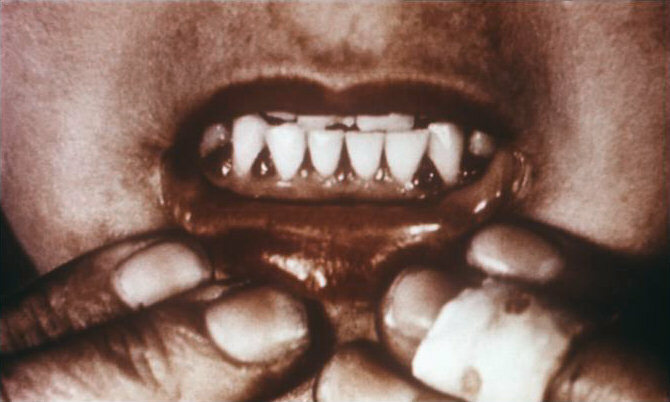 Pernicious anemia is treated by large oral doses of vitamin B12 or by putting the vitamin under the tongue, where it is absorbed into the bloodstream without passing through the intestine. In patients that do not respond to oral or sublingual treatment vitamin B12 is given by injection. 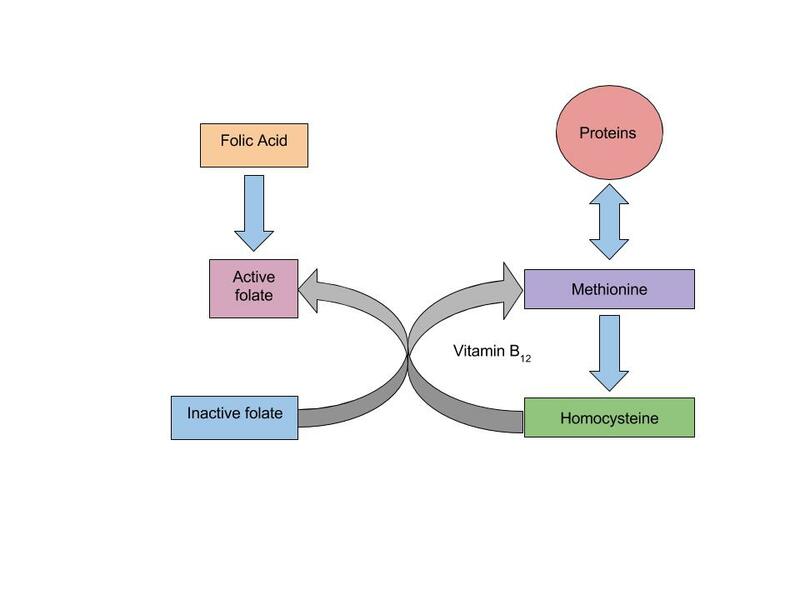 Vitamin B12 and folate play key roles in converting homocysteine to amino acid methionine. As mentioned in Figure 9.19 “ Vitamin B6 Functional Coenzyme Role”, high levels of homocysteine in the blood increases the risk for heart disease. Low levels of vitamin B12, folate or vitamin B6 will increase homocysteine levels therefore increasing the risk of heart disease. When there is a deficiency in vitamin B12 , inactive folate (from food) is unable to be converted to active folate and used in the body for the synthesis of DNA. 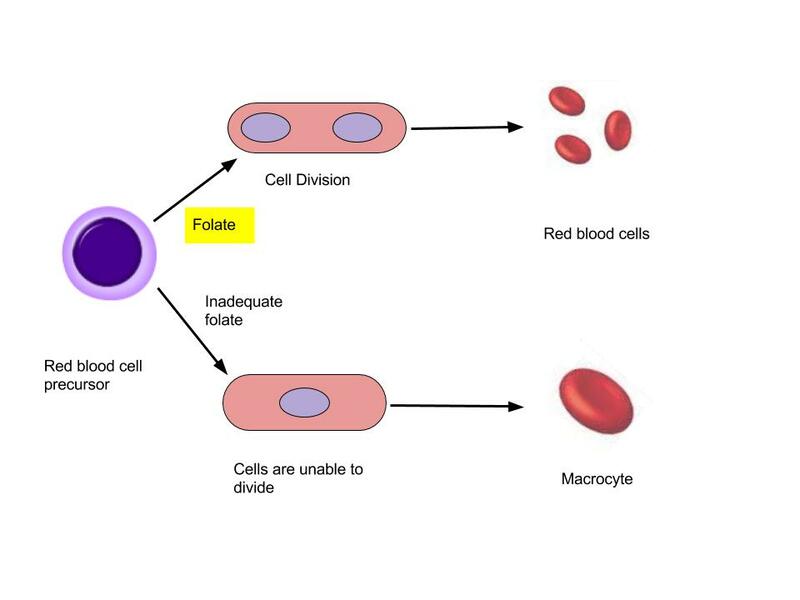 Folic Acid however (that comes from supplements or fortified foods) is available to be used as active folate in the body without vitamin B12 .Therefore, if there is a deficiency in vitamin B12 macrocytic anemia may occur. With the fortification of foods incorporated into people’s diets, the risk of an individual developing macrocytic anemia is decreased. The RDAs and ULs for different age groups for Vitamin B12 are listed in Table 9.27 “Dietary Reference Intakes for Vitamin B12“. Dietary Fact Sheet: Vitamin B12. National Institute of Health, Office of Dietary Supplements. https://ods.od.nih.gov/factsheets/VitaminB12-HealthProfessional/. Updated February 11, 2016. Accessed October 28, 2017. Vitamin B12 is found naturally in animal products such as fish, meat, poultry, eggs, and milk products. Although vitamin B12 is not generally present in plant foods, fortified breakfast cereals are also a good source of vitamin B12. For the vitamin B12 content of various foods, see Table 9.28 “Vitamin B12 Content of Various Foods”. Choline is a water-soluble substance that is not classified as a vitamin because it can be synthesized by the body. However, the synthesis of choline is limited and therefore it is recognized as an essential nutrient. Choline is need to perform functions such as the synthesis of neurotransmitter acetylcholine, the synthesis of phospholipids used to make cell membranes, lipid transport, and also homocysteine metabolism. A deficiency in choline may lead to interfered brain development in the fetus during pregnancy, and in adults cause fatty liver and muscle damage. There is insufficient data on choline so the FNB has developed AIs for all ages in order to prevent fatty liver disease. The AI and UL for different age groups for choline are listed in Table 9.29 “Dietary Reference Intakes for Choline”. Fact Sheet for Health Professionals: Choline. National Institute of Health, Office of Dietary Supplements. https://ods.od.nih.gov/factsheets/Choline-HealthProfessional/. Updated January 25, 2017. Accessed October 28, 2017. Choline can be found in a variety of different foods. The main dietary sources of choline in the United States consist of primarily animal based products. For the Choline content of various foods, see Table 9.30 “Choline Content of Various Foods”. Do B-Vitamin Supplements Provide an Energy Boost? Although some marketers claim taking a vitamin that contains one-thousand times the daily value of certain B vitamins boosts energy and performance, this is a myth that is not backed by science. The “feeling” of more energy from energy-boosting supplements stems from the high amount of added sugars, caffeine, and other herbal stimulants that accompany the high doses of B vitamins. As discussed, B vitamins are needed to support energy metabolism and growth, but taking in more than required does not supply you with more energy. A great analogy of this phenomenon is the gas in your car. Does it drive faster with a half-tank of gas or a full one? It does not matter; the car drives just as fast as long as it has gas. Similarly, depletion of B vitamins will cause problems in energy metabolism, but having more than is required to run metabolism does not speed it up. Buyers of B-vitamin supplements beware; B vitamins are not stored in the body and all excess will be flushed down the toilet along with the extra money spent. B vitamins are naturally present in numerous foods, and many other foods are enriched with them. In the United States, B-vitamin deficiencies are rare; however in the nineteenth century some vitamin-B deficiencies plagued many people in North America. 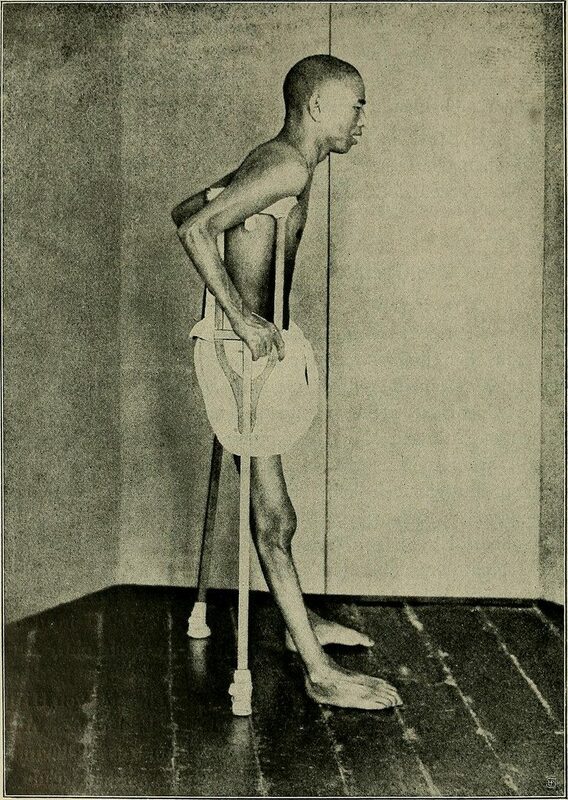 Niacin deficiency, also known as pellagra, was prominent in poorer Americans whose main dietary staple was refined cornmeal. 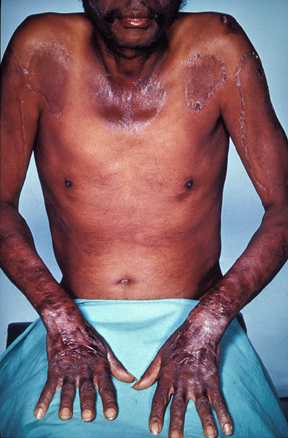 Its symptoms were severe and included diarrhea, dermatitis, dementia, and even death. Some of the health consequences of pellagra are the result of niacin being in insufficient supply to support the body’s metabolic functions. Water-Soluble Vitamins by University of Hawai’i at Mānoa Food Science and Human Nutrition Program is licensed under a Creative Commons Attribution-NonCommercial-ShareAlike 4.0 International License, except where otherwise noted.